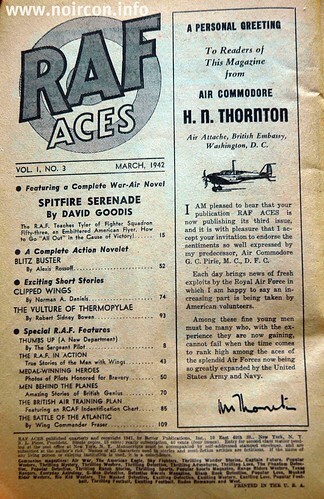 The Writer in The Gutter : RAF ACES - March 1942 "SPITFIRE SERENADE"
RAF ACES - March 1942 "SPITFIRE SERENADE"
Vol. 1, no. 3. 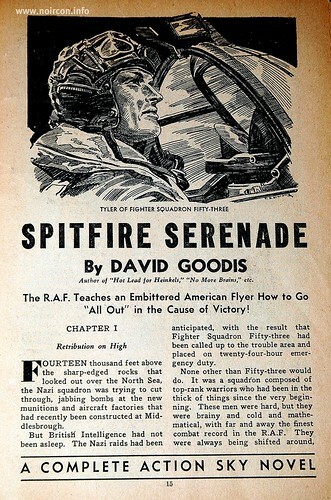 Cover by Rudolph Belarski for "Spitfire Serenade" by Goodis. Includes "Blitz Buster" by Rossoff; "Clipped Wings" by Daniels; "The Vulture of Thermopylae" by Bowen. Special R.A.F. 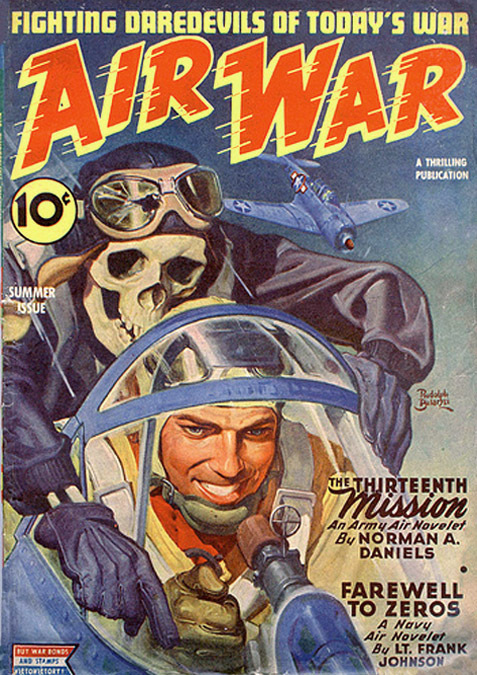 Features: "Thumbs Up"; "The R.A.F. in Action" (true stories); "Medal Winning Heroes"; "Men Behind the Planes"; "The British Air Training Plan"; "The Battle of the Atlantic". 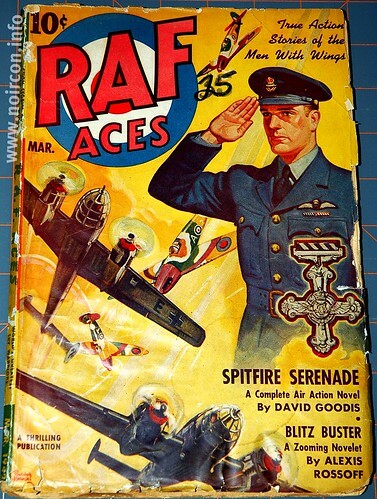 True Action Stories of The Men With Wings! 1942: With the war and paper shortages, titles are killed left and right, including The Whisperer and The Avenger, whose adventures continue in Clues. The Griffon leavesFlying Aces. Another World War II air-war hero, Captain V, begins appearing in Popular’s Battle Birds. Daniels published under his own name and a variety of pseudonyms, writing sports fiction, westerns, science fiction, and romances, as well as radio scripts for the Nick Carter radio series. After the demise of the pulps in the fifties, he covered the same wide variety of genre for paperback publishers. The Masked Detective. 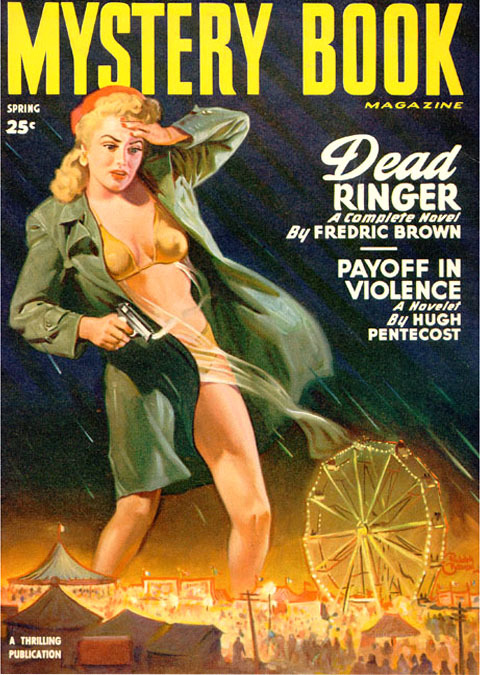 The Detective was created by Norman Daniels and appeared in The Masked Detective, beginning with its Fall 1940 issue. 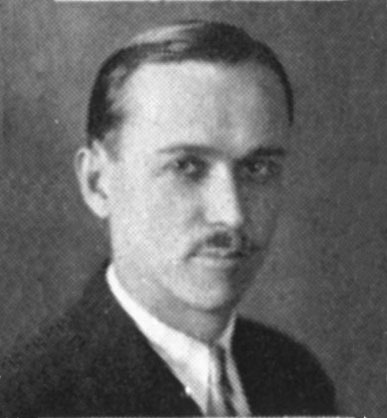 Rex Parker, a reporter for the New York Comet, fought the strange and unusual as well as the ordinary kind of evil and crime. He is a master of disguise, a very good ventriloquist, and a trained boxer as well as an expert at savate. (He's also billed as the "world's greatest crime sleuth," but I think we can set that aside as hyperbole) His beautiful girlfriend, Winnie Bligh, another reporter for the Comet, often got in trouble and required Parker to rescue her. The Detective's opponents were not particularly memorable, although there was one "white-hooded master menace" and also a deluded art vandal. BE SURE TO VISIT NOIRCON.INFO!